Buffy the Vampire Slayer Season 1 Episode 10 may be called "Nightmares", but this was a dream hour. I love anything that resembles horror. And sure, "Nightmares" has problems in it; much like many of Buffy the Vampire Slayer Season 1 episodes. But it gives us the gift of character development, and that is always welcomed. 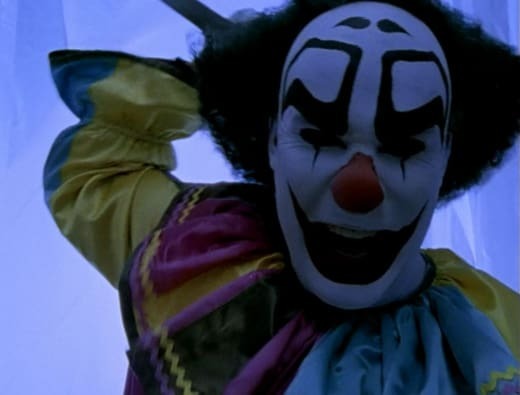 Get your popcorn ready and let's jump into rewatching "Nightmares"! It makes sense that Buffy would be having nightmares about The Master. She has this weird psychic dream power and The Master, at this current point, is her biggest enemy. Her dreams are channeling her fears. And it's giving her a glimpse into who her enemy is (and her potential future if unprepared). When she does see The Master, it's not surprising she knows what he looks like. Her premonitions and nightmares have warned her about him. Joyce: Honey, are you worried your father won’t show? Buffy: No. Not really...should I be? Joyce: Well, of course not. I just, I know it’s a hard situation. You just have to remember your father adores you, no more than I do by the way. Permalink: Honey, are you worried your father won’t show? 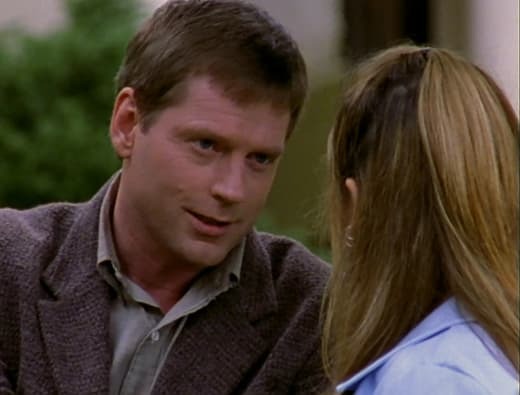 For those new to the Buffy scene, don't get too comfortable with Hank Summers. He will always be a mystery. In fact, he's barely in any episodes. When we do see him, he's barely a blip or non-support to Buffy. I'm not a big fan of the character. Joyce could do better. Part of Buffy's insecurities early on is about her thinking she broke up her parents' marriage with her slaying. It's sad to see her so worried that her father might not show up for the weekend. He should love her unconditionally. Spiders are a valid fear! 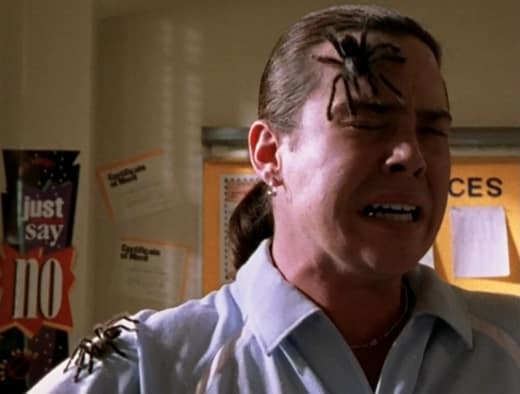 They're creepy and crawly, and the thought of them crawling over you...I can't even right now. When Wendell started freaking out, I nodded and said, "Same." That would be a traumatizing scene for anyone. Though, that class erupted into chaos a bit too quickly. Why did no one help him? Xander: Ah, the hellmouth, the center of mystical convergence. Supernatural monsters. Been there. Buffy: Little blasé there, aren't you? Permalink: Ah, the hellmouth, the center of mystical convergence. Supernatural monsters. Been there. Billy (the little boy) was so creepy. He reminded me of a scary kid from horror movies. He would just appear and something bad would happen. Whether he knew it would happen or after, like Laura going to smoke or Buffy taking the test, we're meant to believe something is strange about Billy. Similar to Buffy the Vampire Slayer Season 1 Episode 9, he was clearly a red-herring. There was no way he would be evil. It would be too obvious. How did the doctor make the connection between Billy's attack and Laura's attack? They were both beaten by a monster-ish man and a weapon. Seriously, that's the only connection. No DNA or physical description of the attacker to tie them together. Come on. This was a flimsy attempt for Giles and Buffy to be introduced to a comatose Billy. I don't buy it. Giles', Xander's and Cordelia's nightmare reflected a lot about their personalities. As mentioned in the rewatch for Buffy the Vampire Slayer Season 1 Episode 9, Cordelia loves her hair. She spends a lot of time taking care of it. The same goes with her popularity status. It's only fitting that her nightmare would be having a disaster of a hairdo and her fall from social grace. Willow must've loved the scene of her being dragged into the chess club. It's such a comic relief moment. Cordelia always deliver with the fun moments. Xander standing in front of class in his underwear is a standard nightmare. It's been done to death on TV for ages and it feels so Xander. Giles, on the other hand, is a surprising case. He loves reading and knowledge. However, him having nightmares of not being able to read, and being trapped in an endless maze of bookcases seems so opposite to him. He spends all day reading in the library. Is he secretly terrified every time he goes into the stacks for research? That's a bummer if it's true. He's always been the snarky and uptight librarian. I would hate it for him to be depressed. Willow's living nightmare was hilarious! Everything about it had perfect comedic timing. You could feel the sheer fear and uncomfortableness she felt on stage with the singer. I was living for her expression. And her voice cracking when she tried to sing made the moment. This might be my favorite scene from "Nightmares". Buffy: Was there someone else? Hank: No. No, nothing like that. Buffy: Then what was it? Hank: Having you, Raising you, seeing you every day. I mean, do you have any idea what’s that like? Hank: Gosh, you don’t even see what’s right in front of your face, do you? Well, big surprise there, all you ever think about is yourself. You get in trouble, you embarrass us with all the crazy stunts you pull, and do I have to go on? Hank: You’re sullen, and rude, and you’re not nearly as bright as I thought you were going to be. I mean, Buffy, let’s be honest, could you stand to live in a house with a daughter like that? Buffy: Why are you saying all these things? Hank: Because they’re true. I think that’s the least we owe one another. Permalink: Well, big surprise there, all you ever think about is yourself. Who else felt so devastated for Buffy? She had a rough time on Buffy the Vampire Slayer Season 1 Episode 10. Her nightmares were the worst. Beyond the test one (which I've had that nightmare a few times before), her father went for the jugular. Sure, it was a manifestation and didn't actually happen. However, fake Hank preyed on all her fears. I think this is the first time we really see how deep Buffy is as a character. She has so much depth to her and pain for a situation that happened before we ever met her. Sarah Michelle Gellar was amazing in this scene. All hail the queen. Was this THE Master taking part in the nightmare or simply a fake manifestation? If it's the former, then it opens up the question as to why doesn't Hank, and everyone else in Sunnydale, not remember their involvement? But, if it's the latter, it explains why The Master recognized Buffy. Buffy and The Master's interactions in Buffy the Vampire Slayer Season 1 are some of my favorite scenes. They have great chemistry together. Almost like a spider and the fly. One of the reasons why I like The Master is that he knows how to get Buffy at her core through dialogue. He toys with her, talks down to her, and fully believes he is stronger than her. It's reminiscent of The First in Buffy the Vampire Slayer Season 7. I love it when Buffy proves The Master wrong and defeats him. But we still have a while to go until "Prophecy Girl". The Master: So, this is the Slayer? You're prettier than the last one. Buffy: This isn't real. You can't be free. The Master: You still don't understand, do you? I am free because you fear it. Because you fear it, the world is crumbling. Your nightmares are made flesh. You have little Billy to thank for that. Buffy: This is a dream! The Master: A dream is a wish your heart makes. The Master: This is real life. Permalink: So, this is the Slayer? You're prettier than the last one. So, wait...did The Master see the last Slayer or just a previous Slayer? I was always confused by this. 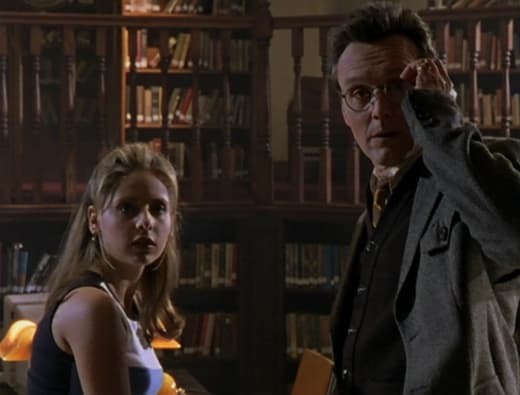 With the way Giles mentioned it, Buffy was the first Slayer to be in Sunnydale. And The Master has been trapped in the underground cavern for nearly a century. When did the previous Slayer see The Master? Who was she? How did she die? And if it was Buffy's predecessor, who was she? This was a storyline I wish got mentioned in the Buffy the Vampire Slayer TV series. It would've been nice as viewers to see Buffy talk about her predecessor and what happened to her. A little backstory is never a bad thing. It's funny to think that the three main Scoobies have been vampires at one point. We see Buffy as a vampire here in "Nightmares" while Xander and Willow were vampires in Buffy the Vampire Slayer Season 3. Why wasn't Giles ever a vampire? Though, we do get him in demon form once. I guess it's a trade-off. A lot of my questions/thoughts about Vampire Buffy are usually answered by it being a manifestation. Like, for instance, why doesn't Buffy shy away from the sun in the hospital? Or, why isn't she evil? This is Buffy's (and Giles's) worst nightmare, so it's safe to say it was only a glamor trick. Buffy: I thought I was dead. Buffy: Don't look at me! Giles: You never told me you dreamt of becoming a vampire. Buffy: This isn't a dream. Giles: No, it's not. But there is a chance that we can make it go away. This is all comes from Billy. If we can only wake him up, I believe that the nightmares will stop and reality will shift back into place. But we must do it now! I need you hold together long enough to help us. Can you do that? Giles: If we can wake him, I believe the nightmares will stop. Reality will shift back to the way it was. But we must do it now. Can you hold together long enough to help us? Buffy: Yeah, I think I can. Buffy: But we better hurry, because I'm getting hungry. Permalink: You never told me you dreamt of becoming a vampire. The "Ugly Man" might be one of my least favorite Monsters of the Week. What does he do? Nothing. All he does is chase people around and hit them when he gets too close. He isn't even the main enemy. Nightmares, and the scary things in those nightmares, are the real villains. 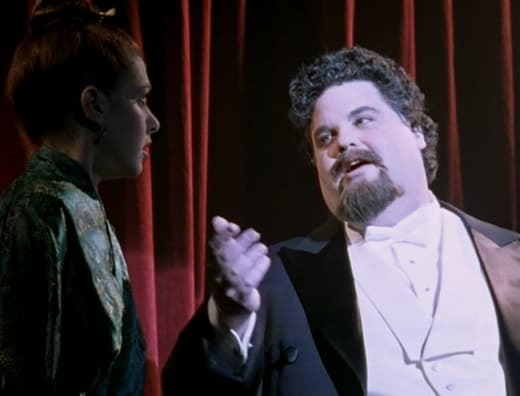 I loved when Vampire Buffy convinced Billy to unmask the Ugly Man. Him conquering his fear was the perfect way to stop his nightmare as he overcame his nightmares and showed strength. We see this theme a few times during "Nightmares" with Xander fighting the clown and Buffy embracing her vampire nature. And the visual of Vampire Buffy leading Billy to pull off the mask was an empowering moment. The Coach/Ugly Man was his attacker, after all. He didn't let the villain have fear over him. What did you think of "Nightmares"? Did everyone just forget they lived in a nightmare world? How evil could Vampire Buffy truly be? Want to join us in rewatching Buffy the Vampire Slayer? We will be posting new rewatch posts every Tuesday and Thursday. Come back here and share your thoughts in the comments about the episode. Willow: Why is she so Evita-like? Buffy: I think it's the hair. Willow: Weighs heavy on the cerebral cortex. Permalink: Why is she so Evita-like?